Miranda Kerr made a late arrival to Paris Fashion Week on Tuesday, and just few hours after landing into the French capital, the 33-year-old model immediately took part in a photoshoot for Louis Vuitton at Place Vendome. The 33-year-old model showed off her leg in a patchwork-style dress from the French fashion house’s Fall 2016 collection. It featured a white bodice and an asymmetric skirt in navy and light blue colors. She layered a beige trench coat over her frock and slipped into a pair of silver boots to add some modern elegance to the look. The mom-of-one kept her accessories to a minimum, wearing only a purple beaded necklace. Her glossy waves and soft makeup rounded out her look. A pair of “Digital Gate” boots finished off Miranda’s head-to-toe Louis Vuitton look. 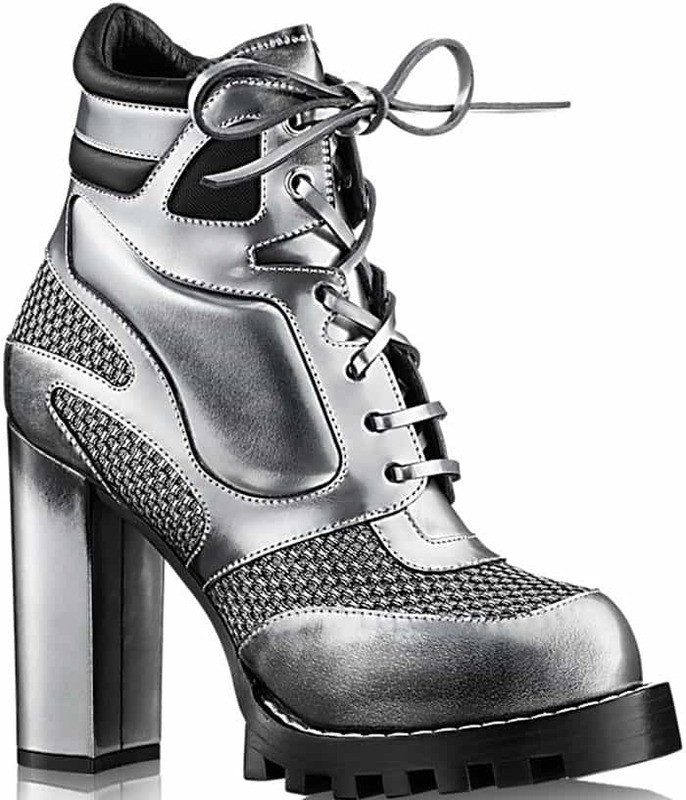 These futuristic silver leather boots feature lace-up fastenings, about 0.5-inch lugged platforms and 3.7-inch chunky heels. Get these boots at Louis Vuitton.